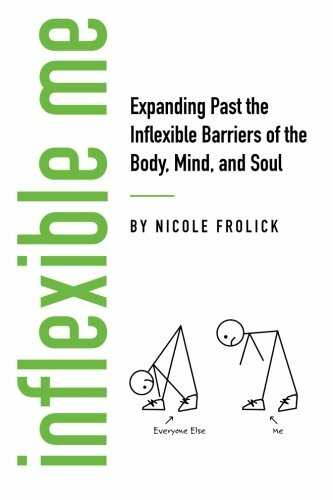 Nicole Frolick is an international expert on Flexibility, an inspirational speaker, intuitive life coach, co-host of the Enlighten Up podcast, and the author of Inflexible Me: Expanding Past the Inflexible Barriers of the Body, Mind, and Soul. Her devotion to her work is anchored in illuminating the true power within you by navigating the inflexible limits that hold you back from your true expansive self. Understanding the struggles of an inflexible body and how frustrating activities like yoga can be, Nicole learned to face her own inflexible fears leading to a discovery that increased her physical flexibility faster than any yoga class previously had. But a process that began as a physical journey, morphed into her greatest spiritual journey revealing that a flexible body required a flexible mind to make the strides she wished for. Her Four Fundamentals of Flexibility can be applied to all areas of life, not just your yoga practice. Through consistent application of these fundamentals, Nicole has been able to navigate a quick career change, use her fears to guide her towards her greatest passions, strengthen the acceptance of her body, find deeper connections in her relationships, and live her life from a place that brings full joy into everything she creates. Her spiritual practice has been a major part of her life since she was 17, but only fully stepped out of the spiritual closet in 2016, embracing her deepest passion: spirituality. Her passion lies in helping others discover what it means to live less out of fear and more out of love. She believes too many of us live in our limited (fearful) mindset, preventing us from expanding into our fullest potential. Her devotion to her work is anchored in illuminating the true power within you so that you become the best version of yourself in all aspects of your life. Utilizing her Four Fundamentals of Flexibility, Nicole shares with her audiences the importance of flexibility in accessing the greatest potential of individuals and companies. In today’s world where the business landscape demands agility and quick adaptation, employing flexible minds becomes the foundation for success. Individuals and companies that can expand their perceptions find they are able to operate at a higher advantage by accessing more options for solutions through limitless thinking. Learning how to shift the internal world to create the desired external world, flexibility teaches those how to cultivate growth, creativity, innovation, and positive corporate culture. This empowers individuals and companies to move beyond their current limitations, accessing their true limitless potential.